Joining our VIP club is easy and free! 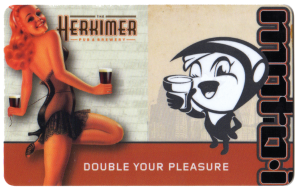 You can join in our restaurants (The Herkimer or moto-i) or online via this link. Every time you dine at our restaurants you will earn points redeemable towards rewards. We will add you to our VIP newsletter that will update you about specials and deals. You may unsubscribe from the newsletter and still receive all the benefits of our VIP program. When you sign up for the VIP club you will get 1 point for every $1 you spend at our restaurants, except Monday nights, when you earn double points for each dollar! For every 150 points earned you will get $10 credit added to your card. This credit can be used at any time by telling your server you would like to redeem credit. The credit never expires and there is no maximum on your credit, so you can let it build up and redeem when you want. Don’t forget to add your birthday to your profile and we will buy you a pint of beer or a glass of sake on your birthday. Check your balance, view past bills and update your profile. Your phone number is used for an alternative form of account look up if you happen to lose your card number. We do not call or send text messages. When signing up for the VIP club, you will be added to our email list. You can unsubscribe at any time and still be a part of the club.